Copy and burn high quality CDs, DVDs and Blu-ray Discs. Rip audio CDs and convert music files or even burn DVD-Video, BDMV, and AVCHD compilations and create lasting discs with SecurDisc. 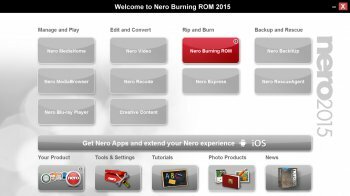 With a huge background in professional CD, DVD and Blu-ray Disc burning, Nero Burning ROM supports the largest variety of drives. Bloatware. I used to love this app back in the 6.x days, but just about everything newer has been terrible. Nero use to be good but now it is just bloated. There are plenty of free cd/dvd burning programs out there that are just as good if not better. A massive package for £60 quid... But unfortunately it became defunct in many ways as Open-Source & freeware, much of which requires No Install Crept onto the Net. A useful tool in the package is "Nero InCD" which can be found most Anywhere, FREE. The "Die-Hards" will find NERO useful, but do some research before Paying..!! Try @Sourceforge .. @Free-codecs .. OR go for a "Top 9" free video..
OR Top 8 DvD Apps..
NO. I don't work for Techradar. That's what Google threw up..... Good Luck..!! Nero 15 compared to 12.5 is slightly better because of new features, but on other hand they added some restrictions in Nero recode 2014 (15v.) SD video file max bitrate 2500kbit/sec (even youtube quality is better!! ), MediaHome still uses about 6GB RAM after playing 1.5h video file >.< I replaced some Nero sub-applications by other softaware (Ashampoo burning studio, Cyberlink PowerDirector, 4media HD video converter, Arcsoft TotalMedia Theatre), but still can't find multimedia suite to replace Nero by 100%. Too bloated, if you want a commercial app, try Astroburn. I'm still using v6 on XP and v8 on Win7. Why is a free download and demo listed as Freeware? Do people forget what FREE means!!! Shareware, Demo Ware, and Trial Ware, doesn't mean FREE!!! Please stop listing stuff wrong. Version 6.6.1.4 was the last good version. Long time ago it was perfect software. Now it turned into something crap (the best MMS was Nero 9 so far). Nero prefers to add new shiny things instead of fixing reported bugs. Whats the point to have latest soft with outstanding features that do not works?! Plus technical support of Nero is very poor: they simply ignores your reported issue instead of trying to reproduce it ... >.